A banned play and a never before performed script are to be staged by Midlands theatre company FRED. Friend Or Foe? 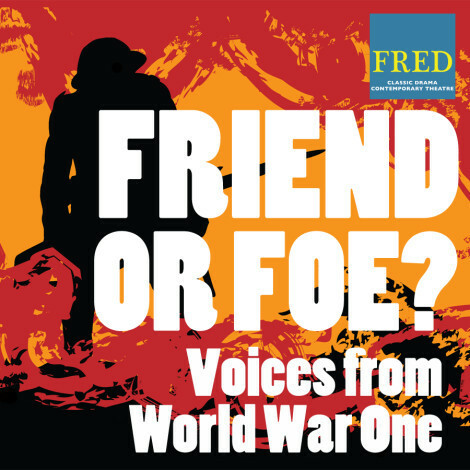 Voices From World War One features three one-act plays written during The Great War which reveal much about the mindset of the day. Though performed in America, Miles Malleson's Black 'Ell was banned in England until the mid-1920s. Returning home from the frontline, a battered trooper is haunted by his experience, a predicament his family and fiancée are unable to grasp. X=0: A Night Of The Trojan War avoided censor by placing the action in a classical setting. Two soldiers from opposing factions in the Trojan War discuss the folly of conflict. The play was written by poet John Drinkwater, who was also Stage Manager at The Birmingham Repertory Theatre, and was at first greeted with favourable reviews. But it's core message concerning the human cost of hostilities resulted in a swift U-turn, and the writer was heavily criticised in the local press of the time. The incident reportedly damaged Drinkwater's reputation, although his post-war play about assassinated US president Abraham Lincoln later became a huge Broadway success. The FRED theatre company in rehearsal for Friend Or Foe? Finally, The Muntion Worker is unique in that it presents a distinctive female yet also pro-war voice. Written by Lady Aimée Byng Hall Scott under the name 'Alec Holmes', the play concerns a woman's desire to work herself to death in a munitions factory as part of the war effort. With no records of any previous performance, FRED believe this will be a much delayed World Premiere! While the work of poets and even visual artists from the period are well known, playwrights are less celebrated, something FRED's triple-bill is keen to address. Friend Or Foe? runs from Thursday 31 March to Saturday 2 April 2016 at @AE Harris, 110 Northwood Street, Birmingham B3 1SZ. Performances at 7.30pm (Thu-Sat) and 2pm (Sat), with the Thursday performance followed by a special Q&A with the cast and leading academics. The production can also be seen at The Cockpit, Stratford-upon-Avon on Wednesday 23 to Saturday March 2016, and The Cockpit Theate, Marylebone, London, on 29-30 March 2016. Why? A new light on an old conflict.